What George W. Bush called the "first war of the twenty-first century" actually began more than 2,300 years ago when Alexander the Great led his army into what is now a sprawling ruin in northern Afghanistan. Accounts of Alexander's invasion of ancient Bactria read eerily like news from our own day. In this vivid, meticulously researched, and elegantly narrated book, Frank L. Holt follows Alexander's historical, archaeological, and numismatic legacy back and forth between ancient Bactria and modern Afghanistan. Recounting the plight of the most powerful leader of the time as he led the most sophisticated army of its day into the treacherous world of tribal warlords, Holt describes those grueling campaigns and the impact they had on Alexander, his generals, their troops, and the world. Into the Land of Bones also examines the conflict from the point of view of the local warlords who pushed the invading Greeks to the limits of their endurance—and sometimes beyond, into mania and mutiny. The lively narrative situates the current war in Afghanistan in a broader historical perspective. 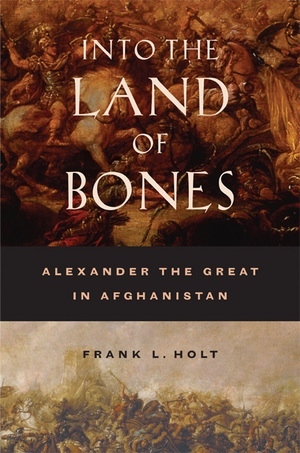 Holt explains how the three modern superpowers that have invaded Afghanistan—Britain in the nineteenth century, the Soviets in the twentieth, and the United States in the twenty-first—are continuing the struggle that Alexander began centuries ago. That this legacy continues to play itself out today is a testament to the timeliness of Holt's fascinating and original account. Frank L. Holt is Professor of History at the University of Houston. He is the author of Alexander the Great and the Mystery of the Elephant Medallions (California, 2003), Thundering Zeus: The Making of Hellenistic Bactria (California, 1999), and Alexander the Great and Bactria: The Formation of a Greek Frontier in Central Asia (1988) and editor of The Greeks in Bactria and India (1985).